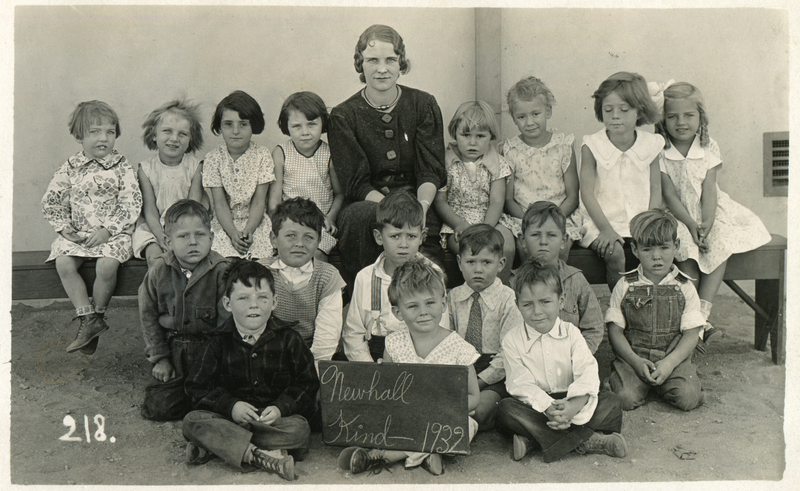 Newhall School kindergarteners, 1932. Miss Ruth R. Pengilly, teacher. Front row, from left: Jimmie White, Dickie Thronburg, Bobbie Cram. Middle row: Leonard Eaton, Arthur Bautelle, Vernon Walk [father of 1980s MLB pitcher & 1974 Hart grad Bob Walk], Stanley Cook [cousin to Vernon], Junior Byers, Bobby Carson. Top row: Mollie Larinan [of Pico Canyon], Lois White, Marie Brown, Jossie Sanderson, Miss Pengalee, Pearl Mae Bricker [Bricker's General Store], Aileen Pensons, Virginia Carter, Mary Jane Kaster. Not pictured: Elsa Dietze, Charles Hayes, Mary Lou Goodson, Freddie Siocet, Noreen Jauregui [Andy Jauregui Ranch]. Identifications by Patricia Cook Bennett (nee Patricia Pearl Cook), who graduated from Newhall School (eighth grade) on June 9, 1939. Researcher Tricia Lemon Putnam determined that Ruth R. Pengilly (of Minnesota) was one of three teachers who lodged with Gwenfred L. McAllister at (what was then) 1016 Walnut Street in Newhall — the others being Tillie F. McConnell (of Nebraska) and Lucia G. Root (of Arizona). Pengilly, who was 25 in 1930, was divorced; McAllister (28), McConnell (29) and Root (25) were single. Click here to view the Census record. 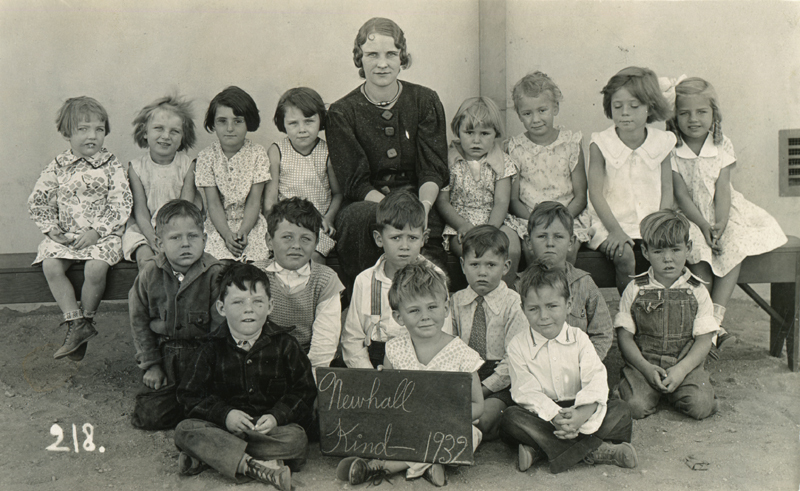 This is the fourth Newhall schoolhouse, erected in 1928 at what is now 24607 Walnut Street. (The first burned down, the second met an uncertain fate and the third was outgrown). The fourth school burned down in February 1939 (just prior to Patricia's graduation) and was rebuilt in place. PC3201: 19200 dpi jpeg from original photograph donated 2003 by Patricia Bennett (nee Patricia Pearl Cook) of Carpinteria.